YOGYAKARTA - Thousands of onlookers filled Jl. Malioboro in Yogyakarta on Wednesday hoping to catch a glimpse of the newlywed royal couple Gusti Kanjeng Ratu (GKR) Hayu and Kanjeng Pangeran Haryo (KPH) Notonegoro as they were paraded along the city's historic street. 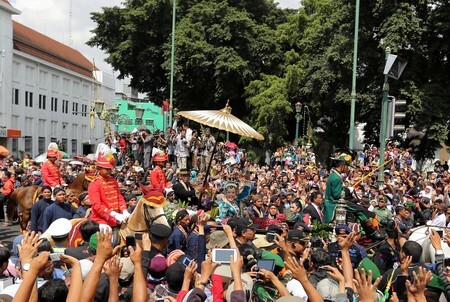 Using 12 royal carriages, the parade started at 9:15 a.m. from the Yogyakarta Palace and headed toward Kepatihan where the royal wedding reception was held. Along the way, people enthusiastically greeted and waved to them. "This is a rare moment that does not happen frequently. It's alright for me to skip work for the sake of the parade," Yanto, a local, said as he was carrying his 4-year-old kid in his arms to witness the parade. For Sultan Hamengkubuwono X, who is also Yogyakarta governor, the wedding of GKR Hayu, his fourth daughter, is expected to be the last as his four other daughters are all already married. The four other daughters of Sultan Hamengkubuwono X are GKR Pembayun (eldest), GKR Condrokirono (second-eldest), GKR Maduretno (third-eldest) and GKR Bendara (youngest). The newlywed royal couple, who wore green wedding costumes, were on board the Kanjeng Kyai Jongwiyat cart, which was made in the Hague, the Netherlands, during the rule of Sultan Hamengkubuwono VII in 1880. 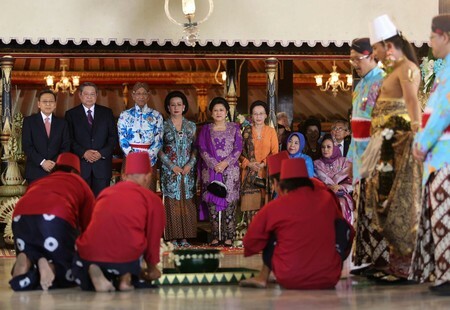 Following the newlyweds were the carriages of the dancers of the Bedaya Manten and the Bedaya Sang Askara royal dances performed in front of Sultan Hamengkubuwono X and the honorary guests to mark the start of the wedding reception. A number of bregodo or royal infantry troop companies escorted the first batch of the parade's entourage. The second group of the entourage was the Kangjeng Kyai Wimono Putro carriage, which carried Sultan Hamengkubuwono X and his wife GKR Hemas, followed by the carriages of their daughters and their respective husbands. Thousands of onlookers filled Jl. Malioboro hoping to catch a glimpse of the newlywed royal couple as they were paraded along the city's historic street. Using 12 royal carriages, the parade started at 9:15 a.m. from the Yogyakarta Palace and headed toward Kepatihan where the royal wedding reception was held. A number of schools located along and near the route of the parade allowed their students to leave early to give them a chance to witness the parade. 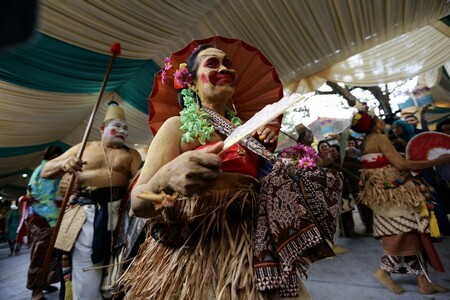 Dancers of the Bedaya Manten and the Bedaya Sang Askara royal dances performed in front of Sultan Hamengkubuwono X and the honorary guest. "This is a rare moment that does not happen frequently. It's alright for me to skip work for the sake of the parade," said a local as he was carrying his 4-year-old kid in his arms.